NatWest and RBS customers regularly access mobile banking through smart phone or tablet apps but now some customers are about to experience mobile banking in a completely new way – high tech on wheels. 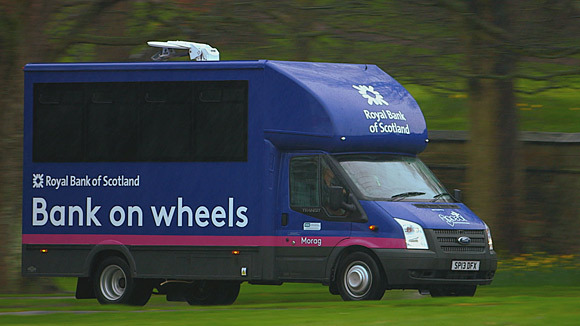 RBS has invested £600,000 in five new mobile banking vans which offer some of the latest technology, such as iPads for customer use, that is only just beginning to appear in high street branches. All five vans will cover new routes, and allow flexibility for the existing mobile fleet to extend their range to new areas. The first mobile branch was introduced in 1946 on the Isle of Lewis, for crofters who were too busy weaving tweed to make it to the main town, Stornoway. 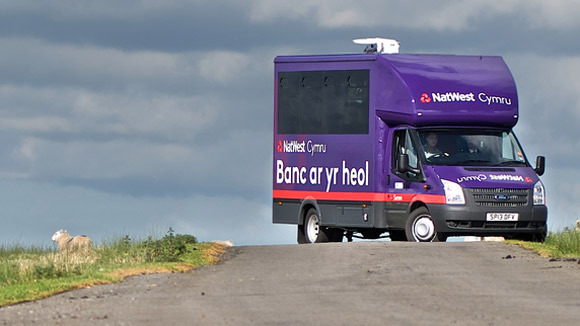 RBS and NatWest now has 19 mobile banking vans on the road at any one time, visiting 357 communities and covering 7,000 miles each week around the UK, providing easy access to banking facilities for customers who for a variety of reasons might struggle to get to their nearest branch. But Jane Paterson, who is in charge of rolling out the new fleet of high tech vans, says the new vans are “very different in look and feel”. Gone are the traditional counters and glass screens, and the staff no longer need to call up the home branch to get a customer’s account balance. Instead a Dawson antenna on the roof means that wherever the van goes, customers can log in to their account using the mobile van’s iPad. “The satellite means that even in areas where there’s no normal broadband coverage, customers will be able to take advantage of online banking,” says Paterson. Paterson says that customers on all the routes are visited at least once a week, and often twice, and the visits become a focus for the local community. 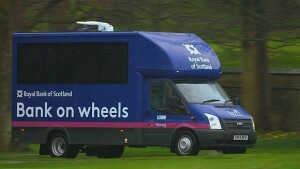 Jim Russell has driven an RBS mobile van to Moffat, in the Scottish Borders, every Thursday for 14 years. The town has never had an RBS branch, but customers based in or around the town still get a very special service from Jim and his colleague Audrey Murphy. “If customers are ill, and cannot come down, if they’re not far off route, we’ll drive to their houses,” says Jim. If regulars do not turn up, they may get a text, to check if they are OK. The older ones might even get the snow swept off their doorsteps. Transactions in RBS branches have fallen by 30% since 2010, indicating that the way customers want to access banking services is changing. Many are happy to conduct their banking online – more than half of RBS and NatWest customers use the banks’ online and mobile banking services regularly, and 4 million customers are expected to download the mobile banking app by the end of 2014. But the new mobile vans will provide a more personalised service to customers – especially those who live in remote areas where online banking is not always possible. “It’s about being where the customers want us,” says Paterson.